Dropping your price to win business can be a fool’s game. Anyone can drop their price. If you win business purely because you are the cheapest you will lose the business just as quickly when someone else offers your client a lower price. If you sell a commodity then don’t bother reading the rest of this article. If you sell a differentiated service or product then read on. A commodity is where we sell the same product or service with no discernible difference to our competitors. Why would anyone pay more for the same thing? We will pay more if there is a real or perceived difference(s) – in ways the client values. I’m not saying never reduce you price but before you do… consider these implications. The price reduction will come straight off your bottom line profit. The price you charge this time will influence the price you can charge next time, and the next time and the time after that. 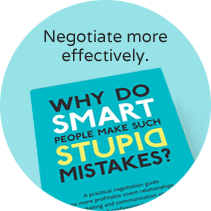 This may negatively impact your relationship with your client and even your self-belief and confidence. Confidence is vital. Clients are attracted to your confidence and success. Who is the person you must sell your price to first?…..YOU. If you don’t believe in your price and value then why should anyone else? How reliant you are on a particular client will affect that confidence. No client should be more than 12-15% of your business. This means you can say ‘no’. This is a vital part of any negotiation. Sometimes I meet businesses where their biggest client is 30%, 40%, even 50% of their business. This is crazy – all you can say to those clients is ‘yes’. how your client is better off afterwards. Find the right moment and ask your current clients why they like doing business with you and how they have benefited from your product or service. Ask really probing questions to get under the skin of what they value and what is important to them. Then ideally translate that value into money. See how they compare you to your competitors. How are you better? In what ways are you better? When you have distilled their answers take time to think about how you can use this to position your business, your offering, as different to, and superior than your competitors. The third strategy is understanding how you are differentiated from competitors. The more differentiated you are from competitors, and in ways which the client really values, the more readily you can charge a premium price. Ideally increase your prices – when you deliver even more value to your clients. Certainly increase them every year. This is critical given inflation is running around 2%. Identify the triggers which mean prospective clients are more likely to need your product or service. Identify the triggers which mean prospective clients are more likely to need your product or service. For example households who have been burgled are more likely to now buy a burglar alarm. People who buy a conservatory are more likely to buy garden furniture. If you sell B2B services your client may be more likely to buy if they are expanding rapidly. What triggers are precursors for your service or product? If you provide clients with detailed budgets then beware of leaving them to the last minute or doing them in a rush. The other common mistake is not thinking through the detail and missing out obvious items. These can be positioned as optional extras but this is better done at the first stage of costings. I used to have a boss who believed in going in with a low price to ‘win the business’ and then creeping our price up once you are in. in hindsight I think this is stupid and also incredibly difficult to increase your price once you have set a precedent with your first price. When all the client wants to talk about is cost and price you must shift the focus of the client’s mind on value not price.